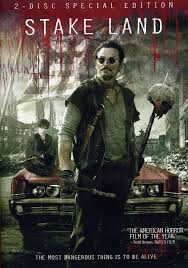 As a general rules I find that films from the mid 1990s to the mid 2000s with a rock/metal soundtrack aren’t very good; they tend to be horror/thriller films that have surprisingly large budgets given how poor the script is. For example if I pick on Powerman5000 in that time period their tracks have featured on the soundtracks of ‘Spawn’ (1997), ‘Bride of Chucky’, ‘Dead Man On Campus’ (1998), ‘End of Days’ (1999), ‘Universal Solider: The Return’ (1999), ‘Dracula 2000’, ‘Scream 3’ (2000), ‘Freddy VS Jason’ (2003), ‘Alone in the Dark’ (2005) and ‘Return of the Living Dead: Rave to the Grave’. Since the scientist was such a creepy pervert to start with the film doesn’t have any shock value to utilise when he goes completely off the rails, nor does it really know what to do with him within the confines of a laboratory and a small pool of potential victims, so it’s not massively interesting. The Husband has been having teeth issues of late, they could be less self-inflicted and are costing a pretty penny so I’m feeling oh-so-very sympathetic. Much to my surprise I couldn’t find many – yes there are a couple of trashy B movies but nothing worth tracking down or spending good money on. There is Steve Martin’s character in ‘Little Shop of Horrors’ and of course that scene in ‘Marathon Man’ but other than that I ended up at ‘Teeth’ which is an odd little film but not really suitable. 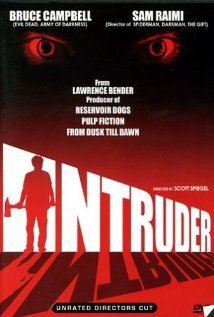 ‘Intruder’ aka ‘Night Of The Intruder’, is a 1989 slasher film that I hadn’t heard of until a colleague lent it to me – in return for my not making them watch ‘Chopping Mall’. The DVD case is best ignored as it suggests Bruce Campbell and Sam Raimi have key roles in the film – they don’t, and it has a picture on the backcover that clearly shows the killer. The premise is that a group of super market staff find themselves stalked by a deranged killer after the store closes, that is literally the whole plot – which is pretty good for a 1980s slasher film! There is a fair bit of gore and some pretty inventive deaths, I will admit to covering my eyes at a couple of points, but I got to the end and it was definitely different! ‘Cursed’ is a 2005 teen horror directed by Wes Craven and written by Kevin Williamson, these three details (date, director, writer) led to certain expectations; namely it won’t be straight horror – there will be attempts at humour (which may or may not work), and it will have plot holes you could drive an SUV through. Also the plot will feature young adults/teenagers in situations with inexplicably few adults. Which is how Ellie (Christina Ricci) is the indeterminately aged sole guardian of her brother Jimmy (Jess Eisenberg) and has a creepy older boyfriend in the form of Joshua Jackson. Whilst Ellie and Jimmy’s lack of parents is covered it is interesting to note that none of Jimmy’s peers appear to have parents either. One night they are involved in a car accident that ends up in the woods and are mauled by a creature. Stuff then happens that requires varying degrees of suspension of disbelief – ranging from “a lot” to “as much as you can muster”. Part of the need for lots of suspended disbelief is due to the rampant inconsistencies with physical objects in the film – for example Ellie’s hair is entirely inconsistent (sometimes in the same scene) and various windows, doors and other things magically repair themselves. It transpires that there was a mid filming hiccup and a lot of rejigging (and rewrites) to the extent that it is a minor miracle the film was unleashed on the world at all. ‘Cursed’ isn’t as self aware as ‘Scream’ but it has enough knowing winks to make up for a very familiar plotline. Everyone in pretty and hip to the extent that it feels less like a horror film and more like an advert for the latest must have product. Despite this multitude of flaws it was an amusing little film that didn’t require too much brain power, had no shocks or twists that couldn’t be seen a mile away and had curiously little blood splatter for a werewolf film! I’d heard very good things about ‘Stake Land’, but I can’t remember from whom. I was convinced my sibling had raved about it, but they deny this. Perhaps it was the friend who gave us flu – although I am blaming them for pretty much anything at the moment. Either way, ‘Stake Land’ was watched and the hype seemed overly generous. The plot is simple, boy watches family experience death by vampires, is rescued by a grumpy man, grumpy and boy go wandering across America looking for the safe zone. Which is pretty much the plot to most post-apocalyptic films ever. There is no humour, no wit, no spark that sets ‘Stake Land’ apart from anything that has gone before it, the only thing is does have is Connor Paolo in the lead role. Unfortunately for Paolo I’ve seen ‘Revenge‘ and his character was an awful waste of space in that, so spent I most of the film failing to suspend my disbelief and increasingly finding that he felt like a waste of space in this as well. ‘Die Nacht der lebenden Loser ‘ was filmed in German in 2004, in 2007 it was dubbed and released to an English speaking audience as ‘Night of the Living Dorks’. Philip, Wurst and Konrad are high-school losers who smoke dope, are bullied and lust after unavailable girls. Then they get turned into zombies and hijinks ensue. It is pretty much like watching a lower budget version of ‘Idle Hands’ with a soundtrack made up of German punk music. It is cold and dark out, it has been for weeks and I’ve taken the time to watch some films from the iffy pile. There seem to be a surprising number of films that are in this pile and some of them have been better than expected – for example ‘Bats’. 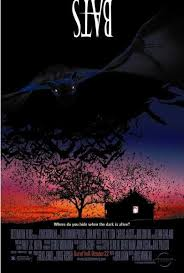 There is a vicious rumour that ‘Bats’ was intended to be a straight horror film, but as the plot is about genetically mutated bats terrorising a small town that can’t possibly be true. The special effects are awful, the dialogue is stilted and it is a really funny film. It does have Lou Diamond Phillips in it and he is possibly more scary than the bats.